Today I’m choosing to motivate myself. I’m choosing NOT to be miserable. Today I’m choosing CONNECTION. I sit here, on my front porch sipping my coffee, and appreciating the quiet. “I miss you dad”, I say out loud through my tears. I don’t know what it is about mornings… I still cry almost every day, usually in the early hours. While life has certainly not stood still, it’s as though a veil still hangs between me, and the rest of the world. I am stronger. Steadier. I can miss him without coming undone. Most of the time anyways. But mornings, ripe with new possibilities, and a chance to start over, only remind me, that wherever I’m heading, he’s not there. Despite this, I have certainly felt his grace, and presence. In some ways bigger, and more absolute than before. Things that once derailed me, seem not to have the same sting. I feel him pushing me along, “Connect Shannon. Don’t back away from your life; your dreams.” We always have a choice. As hard, and as painful as it is to accept this, it is the truth. Yet fear, and sadness, that ruled my life for so long, scramble to take up new residence in other rooms. This energy, needing somewhere to go, only loses its velocity when we are brave enough to release it. It takes courage to move on, tacking up the NO VACANCY sign, kicking fear finally to the curb. When I’m afraid, I cocoon myself. Self-doubt, and indecision weighing me down. A sort of self-imposed sequestering, I turn away from possibility, and hope. Like a bear going into hibernation, I insulate myself with food, and distraction, and busy myself setting up camp in my little cave. I stop moving my body. I take myself off the list of things that need attention. I side step time for reflection. Fear is a way through, and sometimes all I want is a way out. I’m not readying myself to engage with my fear. I am not working through it. I am sitting idly, waiting, worrying and ruminating. Stuck. When fear is in charge, it’s like the bully you avoid eye contact with. You act like it doesn’t bother you. You fake a comfort with its presence, hoping desperately that it won’t notice you. The problem with this strategy is that when invisibility is achieved, all we’re left with is isolation. We feel unseen, unheard, unappreciated, undervalued, and unimportant. Too many “uns”! It’s taken most of my life to see, that these UNdermining feelings are the result of a CHOICE I made. That I am the one that needs to SEE and HEAR ME! Recognition, and external validation are but temporary elixirs. True self-recognition is not dependent on anything, or anyone outside of myself. It is dependent on how I feel about me. This relationship- the one with myself, is where I need to start when I feel myself pulling away. 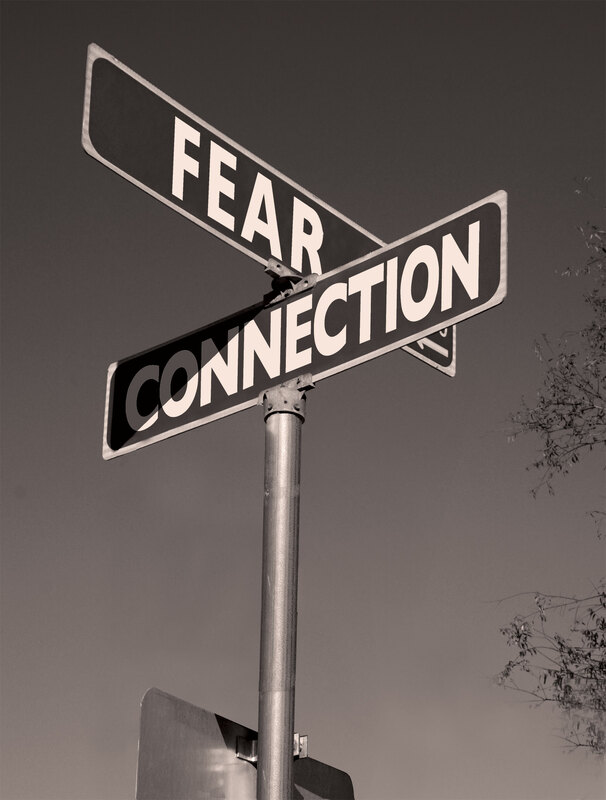 The biggest threat to fear is connection. While I have said that the how of feeling better, is vastly less complicated than the why of feeling bad, it takes intention and practice to stay on the path, like a muscle that needs exercising. When fear is fed, instead of met, we get lost. We stop practicing, and start hiding. My hope is that with time, the choice to live better, while always deliberate, somehow stops feeling like such a chore. I’m on the road again, thanks in part to my dad, my family and friends, and to my two amazing girls, whose existence reminds me everyday that life is good. I have only to look through their lens for a moment, to be brought back to the joy that lives on in my sadness, and the fire within that still roars in the rain. Today I choose to motivate myself. Today I choose connection. *I want to take a moment to thank the nearly 2000 readers of my last article, “New Normal”, who wrote to me, and bravely shared their stories of loss and love. When I started this blog nearly a year ago, I had no idea the impact it might have. Thank you for following, and for sharing a piece of yourself with me. Stay connected. I haven’t written since the end of May. I couldn’t. While writing is my therapy, or a sort of working through. It is also a process that requires readiness, and willingness. I put my heart and soul on the page, and while I often write of struggle, or challenge, I ultimately find the blessings that come with being broken open, or the growth connected with change. I write to pick myself up. It feels good to write. It allows me to see the light around the cloud, and to sort things out. The only time this isn’t true, is when I’m unable, or unprepared to let go of my sadness. I’ve written, or tried to write when I’m in that headspace, and it’s painful. My despair magnified tortuously with each click of the keyboard. It takes longer to get to the part that feels restorative, to the part of the process that heals me. Seeing the silver lining is what makes the hard stuff less hard. It is the reason I do this. To try to let the light in… But sometimes the blessings are harder to see. Sometimes we need to sit in the dark, until we just can’t help but let the light in. I am grief stricken. Struck with grief. I go to bed with my grief, and wake up to it. There are moments of pause in between, where I can set it down like a hiker’s pack, standing upright on its own, like a separate entity, heavy and ominous. There is still joy, and love, and gratitude in those moments of pause. Sometimes I find myself at the end of a day realizing I haven’t cried. But when the grief comes, it swallows me. I’ve not been able to write because I knew what writing would mean. A working through that requires perspective. Writing is a way into grief. Not a way out. Despite my resistance, here I am. Pouring out the contents of my broken heart, letting it be messy, and painful, and hoping that in doing so, I might somehow ease my suffering. On June 1st 2015, we heard the news we’d dreaded hearing for nearly 2 and a half years. No more chemo. I sat there, holding my father’s hand, and squeezing my mother’s knee. 3-6 weeks the doctor told my mother and I privately, as we pressed her with questions when my father stepped away for a moment. A week later he’d be admitted to palliative care, and on July 8th, he would take his last breath. There is no holding back the tears as I type those words. His last breath… The man who’d breathed life and love into me was gone. In the month he had in palliative care, he was fortunate to have a few good weeks. His pain finally managed, and his head clear, he was more social, and talkative than he’d been in the 6 months prior. “Write Shannon”, he would say. He’d tell every doctor, nurse and volunteer about my blog, rhyming off titles, and themes and insisting that I print copies that people could read when they visited. I knew what my writing meant to him. He read everything I wrote. And re-read it. He knew that writing would sooth me when he no longer could. A lifeline when the grief that was ahead engulfed me… He’d even encouraged me to interview him in the last weeks of his life. A cherished conversation- a joining of our two hearts. Those precious bits of audio that will be listened to for years to come. His words tattooed in my brain. “The Last Interview” I intended to call it. An article for another day. But not now. Not yet. Grief is a process, a path. We spiral through its stages, and then spiral through them again and again. A road we’d started out on the day he was diagnosed with Stage 4 Colon Cancer. It’s a very strange thing to know that someone you love is dying. To watch them slowly die. To contend with people’s natural response, that we should have hope, and stay positive. We knew, since diagnosis, that a cure was not a possibility. We knew management of the disease was our goal. We’d spend over 2 years being afraid most of the time. Could he be treated at all? How would he respond? How much could he endure? How would his quality of life be affected? Would he catch some infection that would take him before the cancer did? Would this hospitalization be the last? What will the next set of scans show? How much more time do we really have? All of this interrupted, and punctuated by periods of quasi-reprieve that we’d soon term the “new normal”. We’d get used to using the word cancer and talking about chemo and disease. We’d grow to expect interruptions in his treatment due to low neutrophils. We’d anticipate the stress of waiting for the results of tests, making it ever so slightly easier. We’d get used to my father slowly deteriorating, knowing that with every dip, there would be a leveling off. We’d become accustomed to his failing health, and lessening energy. We’d learn to appreciate a good day for what it was. We’d be thankful if he could sit through dinner with us, or if we could visit for a while on a day where everyone was healthy, and there was no risk of getting grampa sick by our visiting. But whenever there was a change, fear would creep back in, and we’d grieve anew. We’d anticipate the other shoe dropping. Cancer cuts you off at the knees, and reminds you that control is elusive. We learned that the sooner you get used to whatever new normal you’re in, the easier riding the roller coaster will be. We had no choice but to adjust, and we did, again and again. When treatment stopped, and we knew he was entering what would be the last stage of his life, the fear changed and morphed into something that didn’t feel like fear anymore. The fog that descended was unlike anything I’ve ever experienced. A surrendering. A letting go. We scrambled to get our bearings. Things like eating and bathing, or even getting from point A to point B suddenly became hyper deliberate because the inertia of life had halted. It was as though all of our priorities shifted. What mattered, mattered a lot, and what didn’t, just didn’t. There was no decision about this reprioritizing. It was automatic. There was an urgency to everything. Spoken and unspoken prayers reverberated through our family like a radio frequency only we could hear. Time. More time. No suffering if possible. And the hope that he’d make peace with whatever he needed to make peace with, so that he could go when he was ready. When he was ready. I prayed and prayed that he wouldn’t linger for us. That he would get whatever he needed to from us, from his time on this earth, and that he would work through his fear of letting go in the most complete sense. “I am both the happiest, and saddest I’ve ever been, at the same time… Do you know what I mean?” he’d ask me just days before he died. A tear rolled down my cheek, a gentle smile on my face, I nodded. I did understand. There was such light, and love in his dying process. Family that travelled from near and far, friends old and new that visited, he was bathed in love. Cloaked in it. In turn, he exuded it from every pore of his body. He told me, and others, that he wanted those who visited him to leave feeling better than when they’d arrived. His wish was granted. We laughed, and reminisced, and made new memories to go along with all those that came before. We left nothing unsaid. And we cried… It’s hard work to close a life. Really hard. I saw my father weep, and fold into his release. I heard him bellow, felt his mourning. In those last four weeks, I’d see him cry more than I had in my 40 years. More than he had in all of his 73. We teased that he had some catching up to do, being the patriarch of such an emotional family. He appreciated the space we made for these feelings. 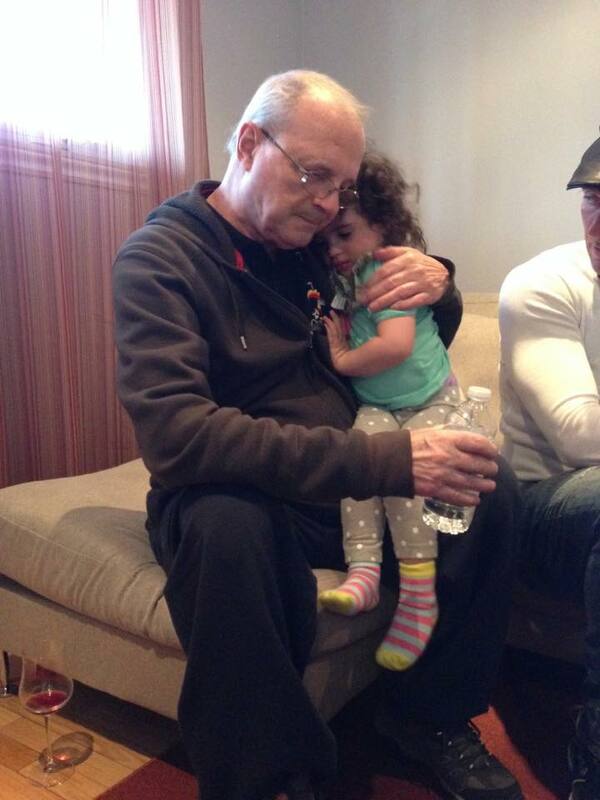 In the last years of his life, and even more so in the last weeks, he’d become such an expressive, and tender man. I can see now that this was the person he always was, just that he hadn’t allowed himself to show these tender parts. He hadn’t learned how. In the end, all inhibition, any wall that was once there, melted away. A process that had started over a decade before, now expedited. There would be no more holding back. There couldn’t be. While he’d come to terms with dying, he too prayed for just a little more time. “Fifteen more minutes Shan”, he’d say. “I asked God for just fifteen more minutes”. He spoke of his deep sadness to leave us. To say goodbye to the love of his life, my mom. To his kids, grandkids and great-grandkids. I’d reassure him that he’d still see my babies grow. He’d just have a different seat in the arena. He worried about how we would carry on. I’d hold his hand, and kiss his forehead, and do my best to comfort him, telling him, “We are cut from the same cloth dad. We will all be ok. How could we not be? We came from you”. He showed such grace, and humility, while demonstrating such strength and tenacity. Both in the fight for his life, and in the closing of it. My dad did everything 100%. His positive outlook, and sunny disposition were contagious. He never complained. We had no choice but join him. To be authentic, supporting each other in our sadness, while keeping sight of all that we had to be thankful for. He would repeat how lucky he was daily. He loved his family. He felt our love. This familial love deepened and expanded as our hearts grew heavier and fuller. It became a life force of its own. This force later enveloped us, protecting us to some extent, in those first few days after he passed. I am thankful for the 15 more minutes we had together, and the incredible gift of a long goodbye. For now dad, I am not ready to set down my grief. I don’t really think I ever will be. My hope is that I may grow stronger with each passing day, and that I can finally set down something else. Something heavier. The thing that tarnishes all good things- my fear. I don’t need it anymore. Maybe I never did… What I feared most happened. Fear never protected me; it only infected the happiness that was there all a long. Even in the dark, there was always light. As I struggle to adjust to yet another new normal, I will remember the man I watched you become. As proud of you, as you were of me. I will hold dear the bond between us, knowing that it will never be broken no matter how far apart we are.